Some of you may be in a small church with a small choir and limited resources, searching for accessible music to sing on a weekly basis. Others of you may be searching for anthems that work well on low-attendance Sundays or during the summer months when choir members are traveling. How high and low do the parts go? Do they stay in those extended registers for any period of time? The most challenging issues are often the high-end of the soprano and tenor ranges. How high can your sopranos and tenors really sing (and sing well)? Is there any divisi within a part (e.g. Soprano I, Soprano II)? How often does it divide? Do you have enough singers in a given section to cover the parts? If you leave out the divisi, will it sacrifice the integrity of the work? Are there any large leaps or awkward intervals to sing or is it mostly steps and skips? How adept is your choir at singing larger intervals? Is it the same few intervals over and over again, or does it change? Are they capable of carrying a more difficult line independently and staying in tune? Are there any dotted or advanced rhythms or syncopations that may be challenging for your group? Is it the same challenging rhythm over and over again, or does it change? 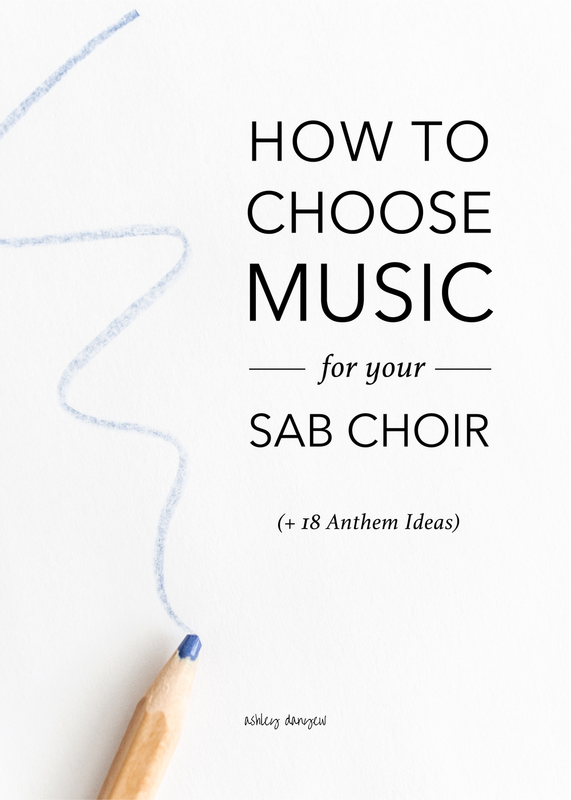 Taking some time to really evaluate the anthems you choose for your choir and assess the abilities of your group in a given season will equip your choir for success and prepare you to direct and lead to the best of your abilities. The simple-verse chorus structure of this anthem works well with small choirs: have soloists or small groups sing the verses (or women, then men, then everyone), with everyone singing the chorus each time. Available in three different voicings, this anthem is a fun, rhythmic setting of the traditional spiritual. Great for a men’s ensemble! This lovely text describes what it means to be part of the fellowship of believers and “gathered as one” into the family of God. Mix it up by having soloists or small groups sing the verses and the full choir sing the chorus. A thoughtful choral setting of this modern hymn. Great text and a flowing piano accompaniment. Similar to You Are Mine, mentioned above, this anthem has a verse-chorus structure that lends itself especially well to smaller choirs. A great opportunity to feature a soloist, or two! The repeating chorus in this anthem is one that will stay with you throughout the week. Lots of great teaching moments and opportunities to work on dynamics, consonants, and phrase-shaping. A well-known spiritual available in a variety of voicings. Great for summer or throughout the year, plus it has a fun piano part! A beautiful setting of this (easy-to-sing) Latin text and a wonderful way to incorporate some musical variety into your choir’s repertoire this year. Works well as an intergenerational anthem with a youth or children’s choir, too! Another easy way to introduce some Latin-singing to your choir. This anthem includes a complete pronunciation guide and just a few Latin phrases to learn. One of my favorite Christmas texts, thoughtfully set with a new melody by Allen Pote for SAB Choir. A simple, lilting invitation to "come to the table of God” and a good way to reinforce lyrical singing and phrase-shaping. A sweet setting of the classic old hymn, “I Love to Tell the Story” with new music by Lloyd Larson. Includes an optional part for children’s choir or child's solo at the beginning. A classic setting of this African hymn - rhythmic, but accessible. For an extra challenge, have your choir memorize it and sing it as a processional! A captivating medley of two Lenten hymns: “O Sacred Head, Now Wounded” and “What Wondrous Love Is This” with flowing piano accompaniment and lyrical cello obbligato. I love this new musical setting of the traditional Advent text, composed by Mark Miller. A great opportunity to work on lightness and agility in the voice and reinforce singing larger intervals in tune. A very accessible setting of this communion hymn, especially if your choir is already familiar with the tune! With swung eighth notes and a catchy bass ostinato, this laid back and slightly jazz setting of the Christmas favorite would be a fun way to end your Christmas program. Rhythmic, but repetitive, this anthem offers an opportunity to introduce mixed meter to your choir. What are your favorite SAB anthems? I’d love to hear what you’ve done with your choir!